Of all the issues that can affect your smile’s function and appearance, crooked teeth are often among the most complex to treat. Besides the asymmetrical look it lends to your smile, malocclusion can make it difficult for your mouth to operate properly by throwing your bite pressure off balance. Your jaw’s joints and muscles can grow exhausted from overcompensating, and your teeth can suffer from excessive friction and pressure as your jaws shift. Unlike cavities and gum disease, malocclusion can affect patients in completely different ways, although nearly all cases require some form of orthodontic treatment to correct. An overbite describes when your upper front teeth extend too far in front of and down over the lower front teeth. Patients with a severe overbite might experience their lower teeth biting into the roofs of their mouths. The opposite of an overbite, an underbite occurs when the lower front teeth extend in front of your upper front teeth. Since correct alignment requires that the upper front teeth extend slightly in front of their lower counterparts, even minor underbites might be obvious. 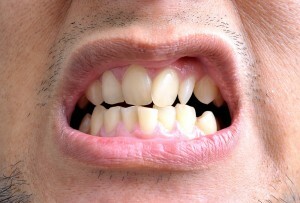 Ideally, every one of your teeth should erupt vertically, or straight up and down, to comfortably meet their opposites. A crossbite means that one or more teeth are positioned at odd angles, either towards your tongue (lingual side) or towards your cheeks. When you smile, the line between your upper front teeth and lower front teeth should align. If they don’t, then your smile suffers from a misplaced midline. Even a tooth that was once perfectly aligned can turn (rotate) out of its normal position. Rotation can occur from crowding or odd spacing, or other instance that cause undue pressure on your teeth. Severe cases of malocclusion often call for orthodontic braces, consisting of brackets and wires attached to your teeth. For many patients, however, Dr. Young recommends a series of clear aligners, or Invisalign™ clear braces, that can straighten teeth discretely and without a many of the complications associated with braces. The aligners are made from clear acrylic that’s virtually invisible while in place. By eliminating the need to bond brackets to your teeth, Invisalign also allows you to eat and brush your teeth comfortably. Simply remove the aligners before your meal or hygiene routine, and replace them once you’ve finished. To request more information, or to schedule an appointment with Dr. Young, contact our Lafayette dentist office at 337-237-6453. We serve families living in Breaux Bridge, Broussard, Scott, Youngsville, and surrounding communities. Dr. Young also invites you to find us on Facebook, where you’ll find news, tips, and valuable resources.